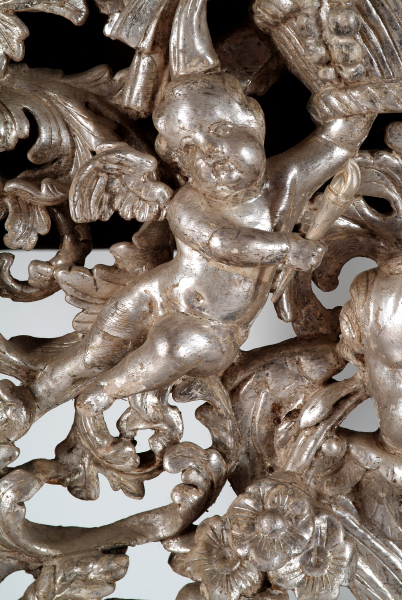 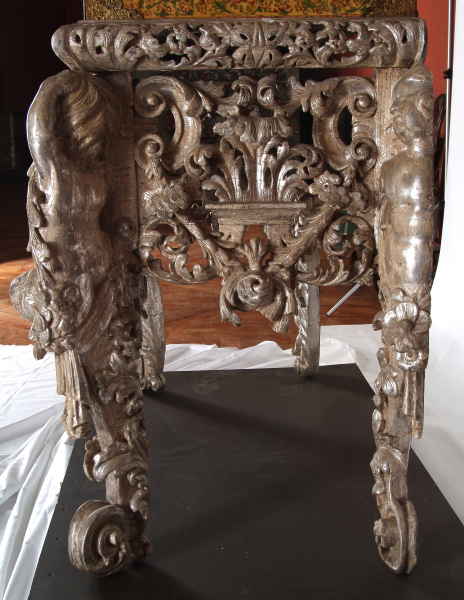 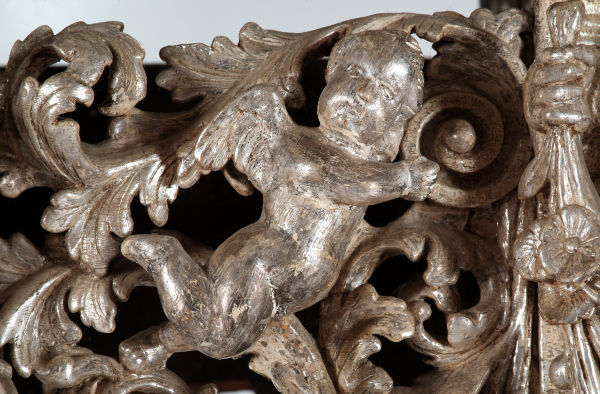 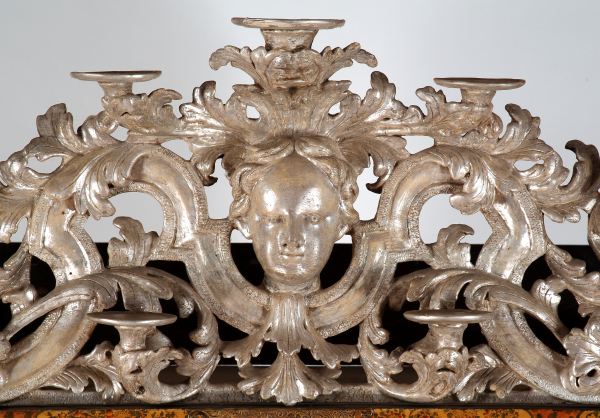 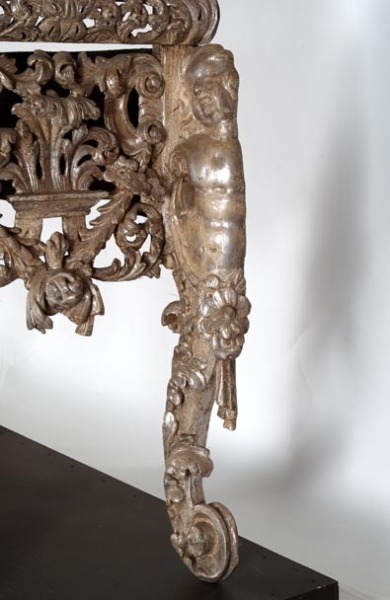 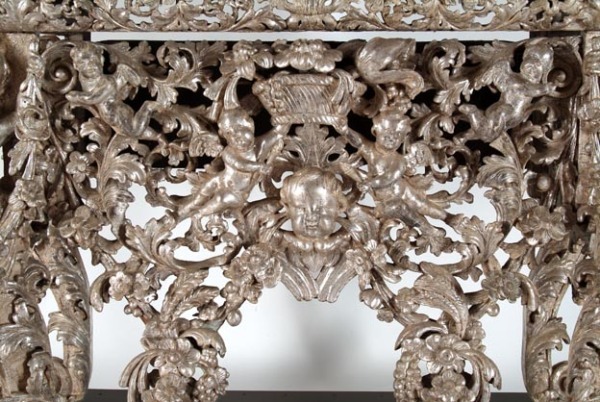 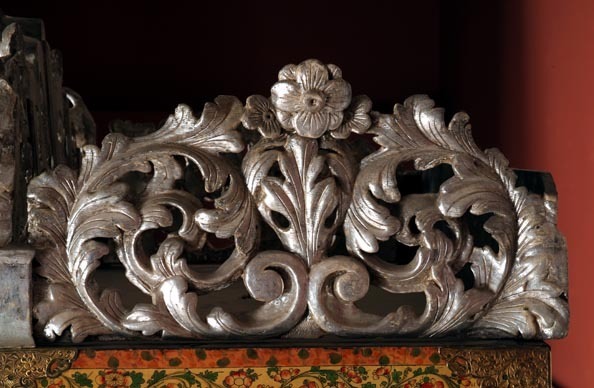 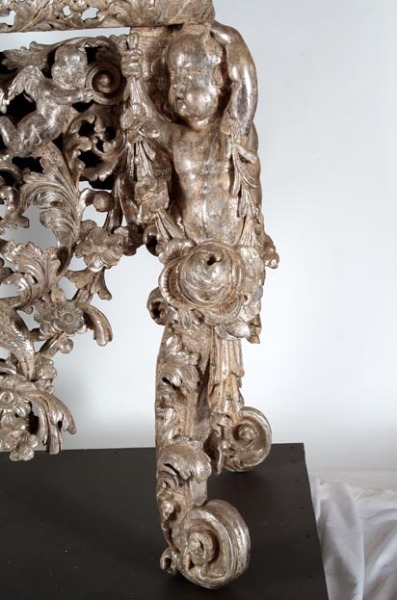 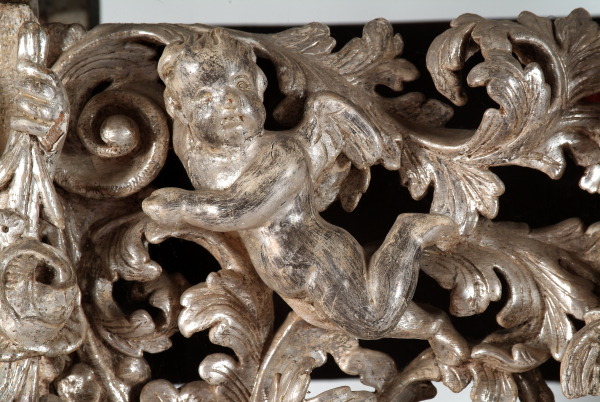 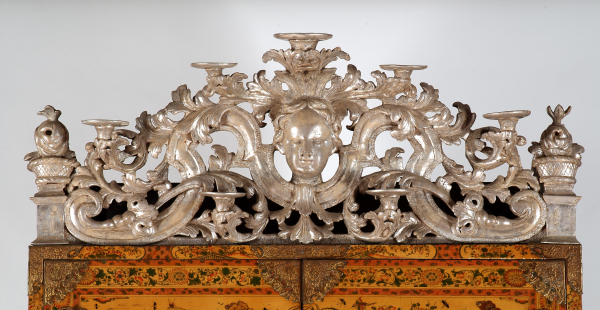 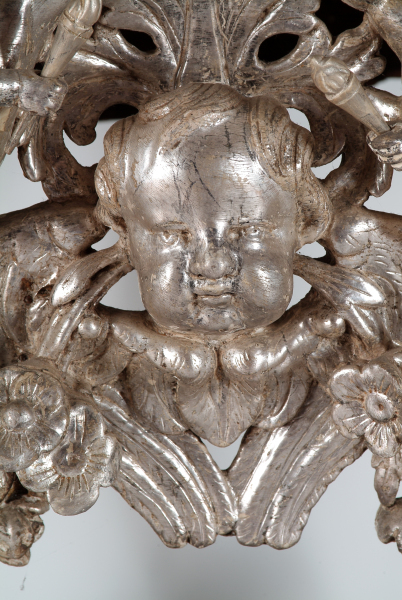 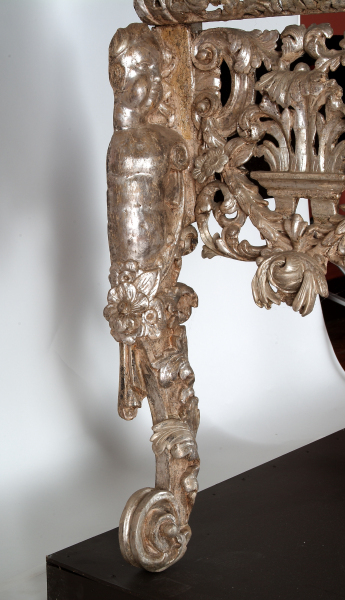 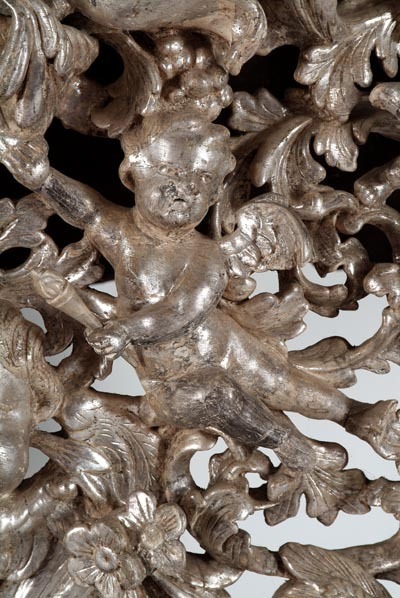 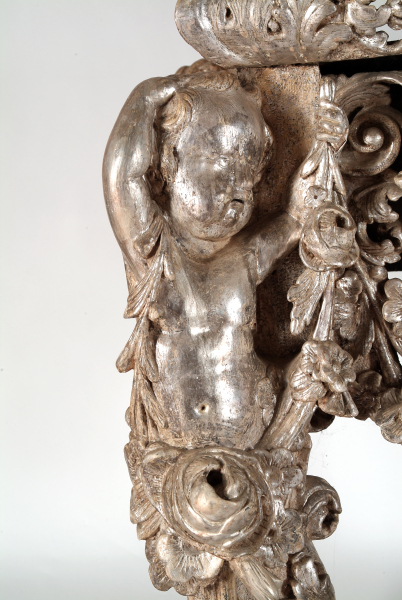 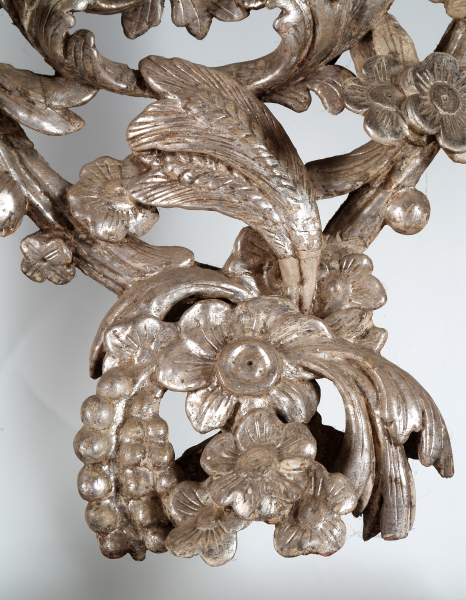 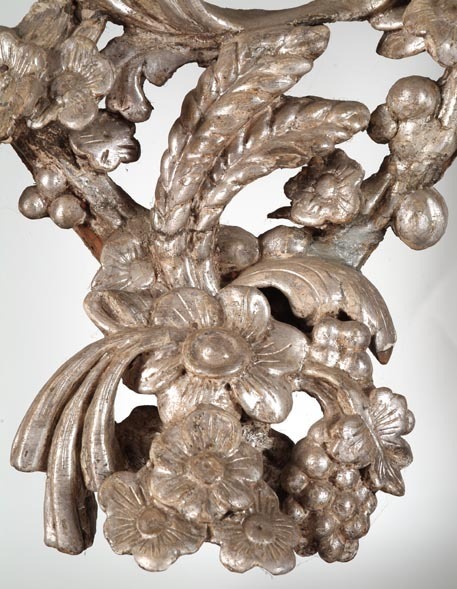 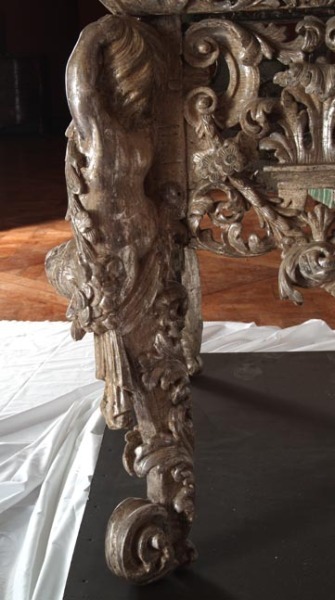 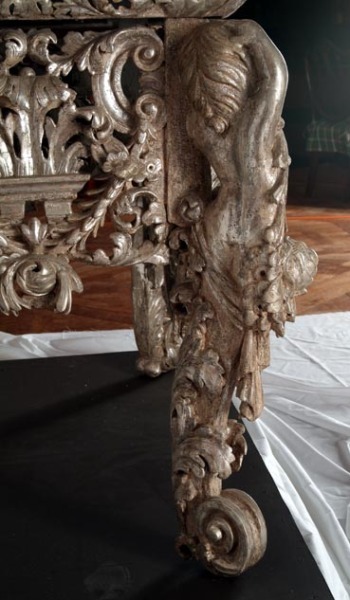 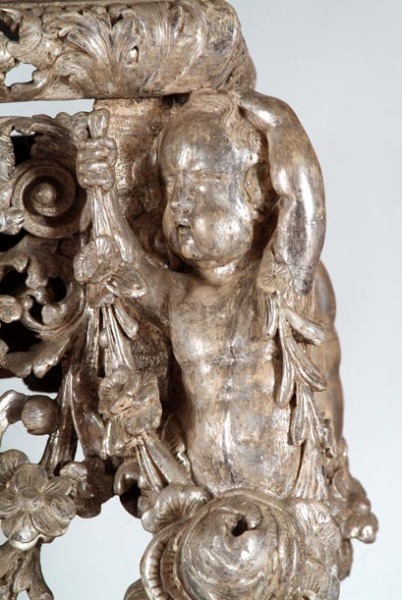 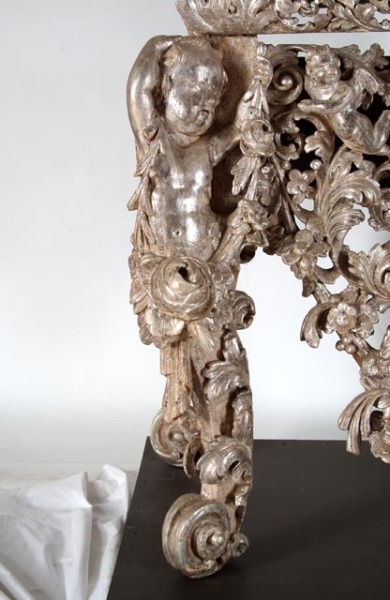 The cabinet is in remarkable condition and is unusual in retaining its original silvered stand and cresting (above). 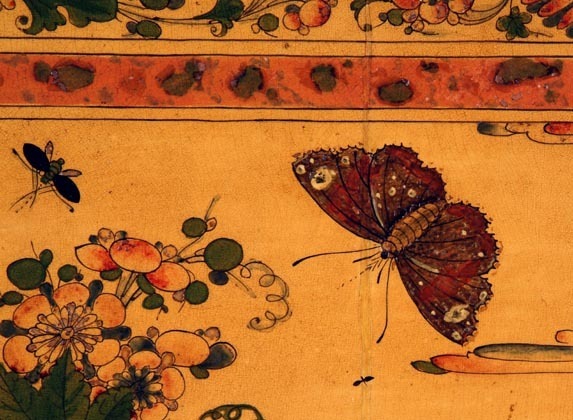 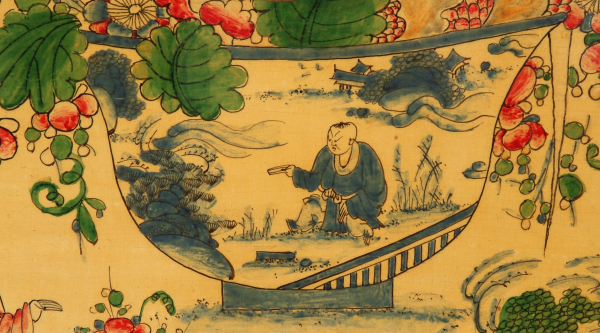 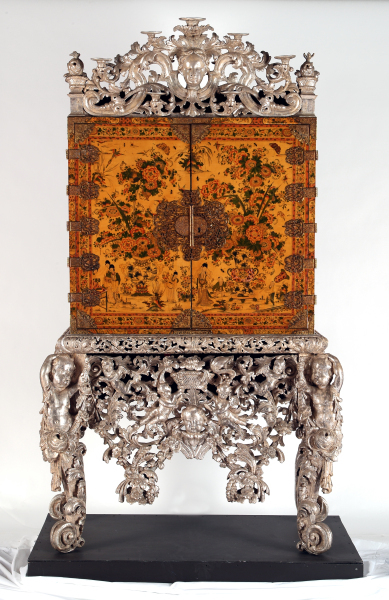 Imported Chinese and Japanese porcelain would have been displayed on the brackets on the cresting. 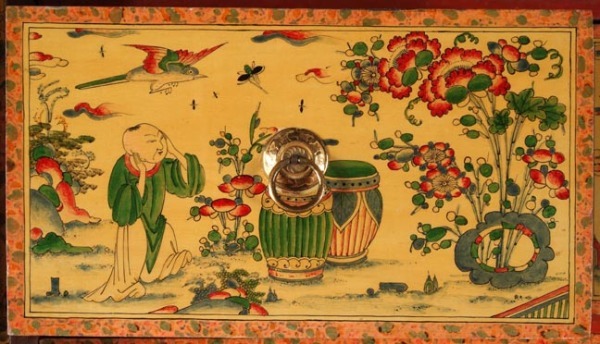 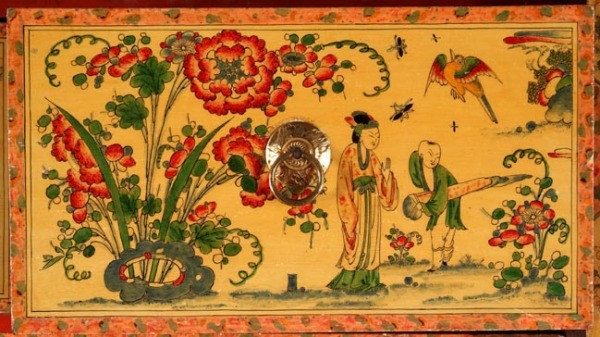 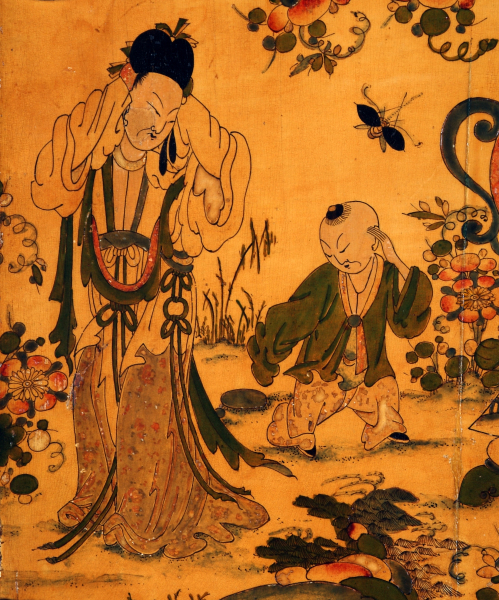 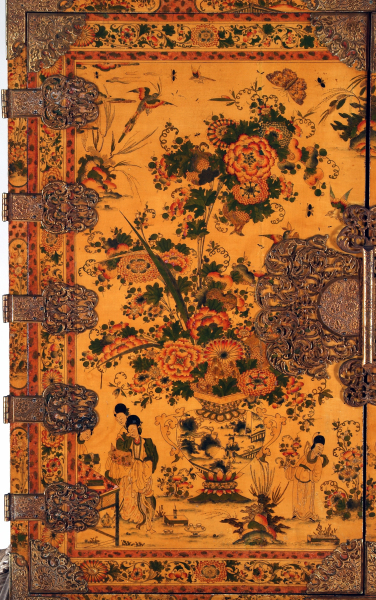 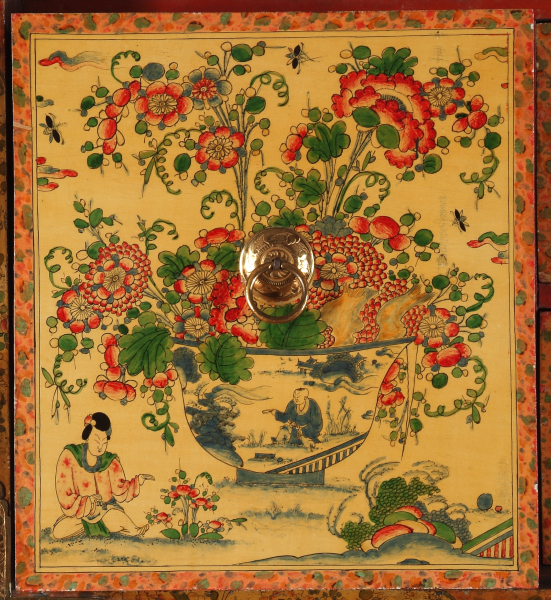 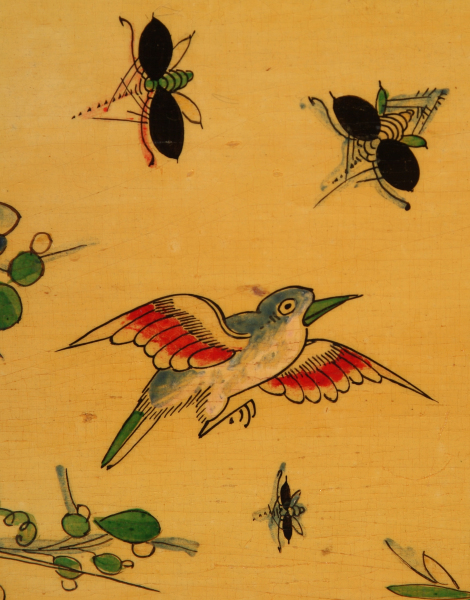 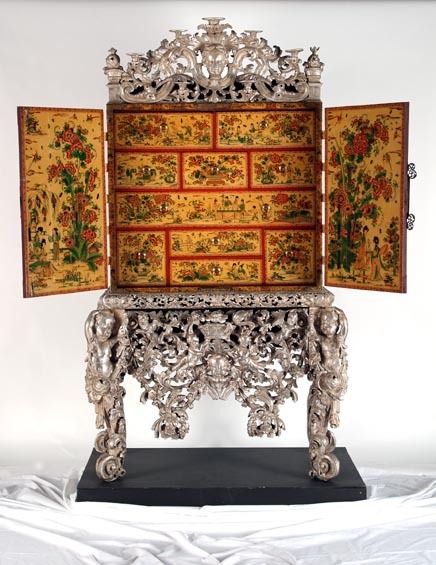 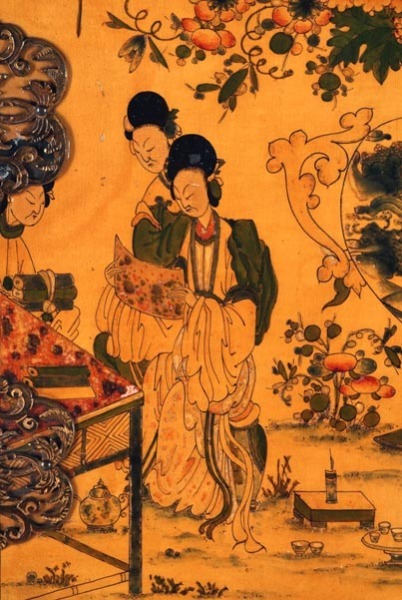 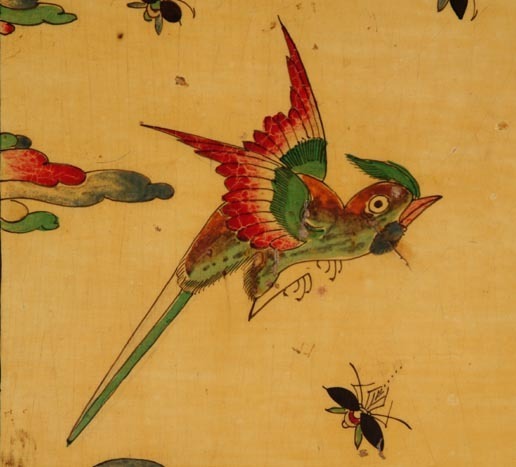 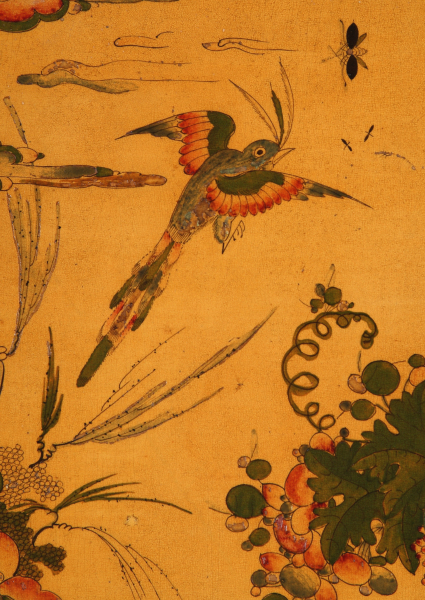 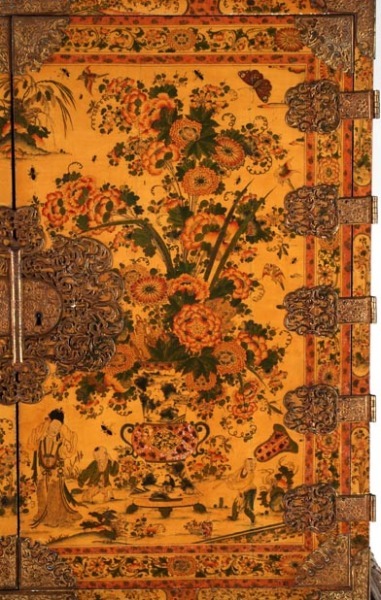 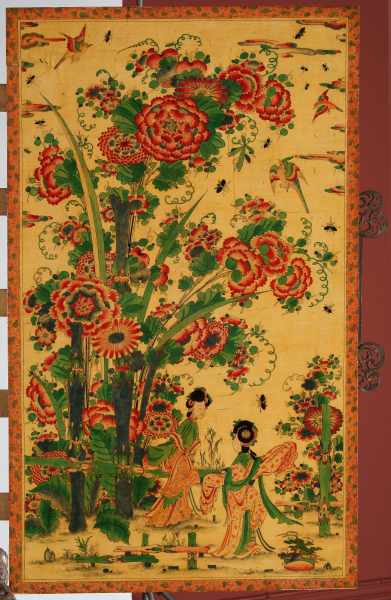 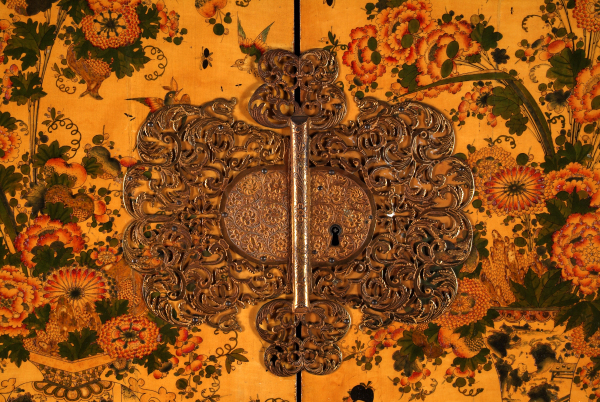 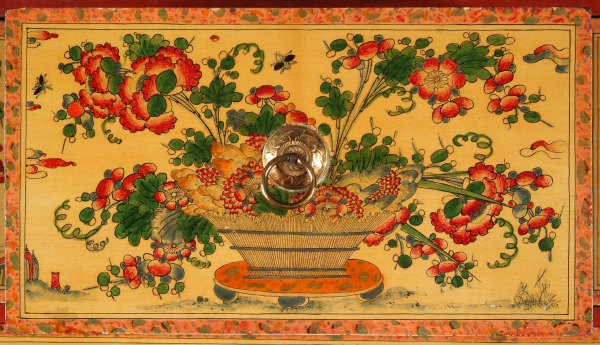 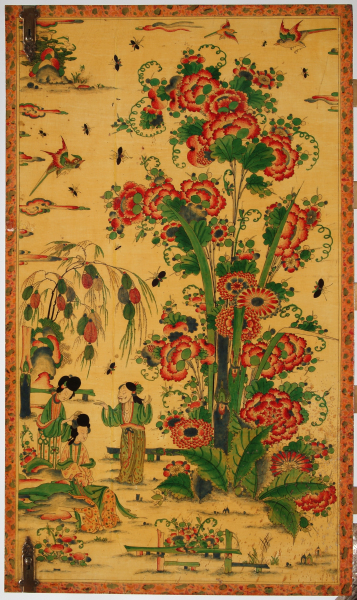 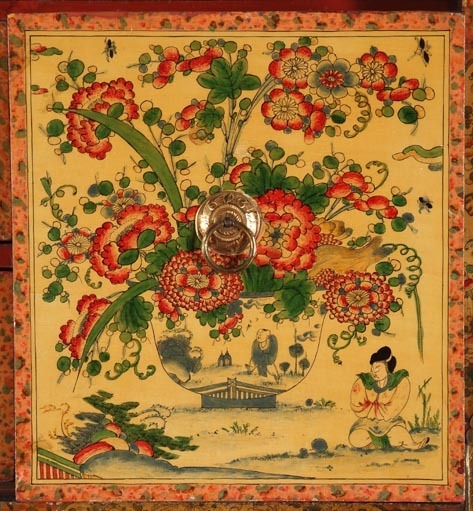 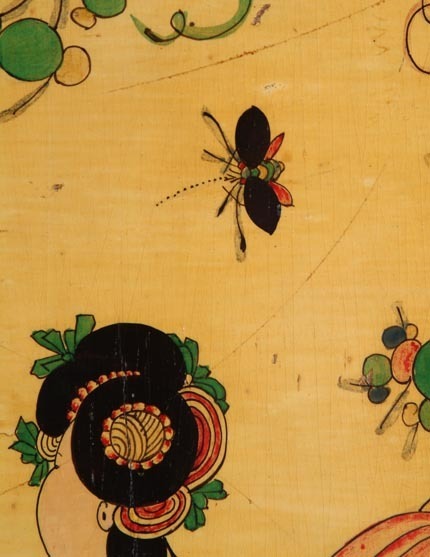 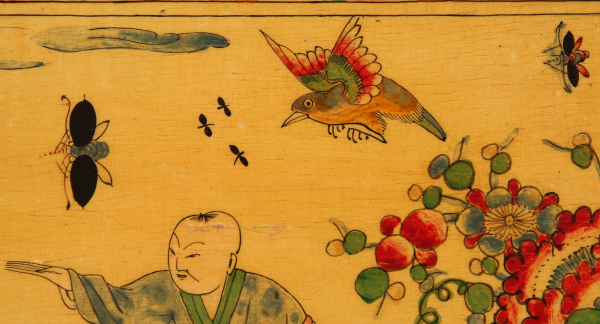 Lacquer cabinets were a great status symbol in the late seventeenth century. 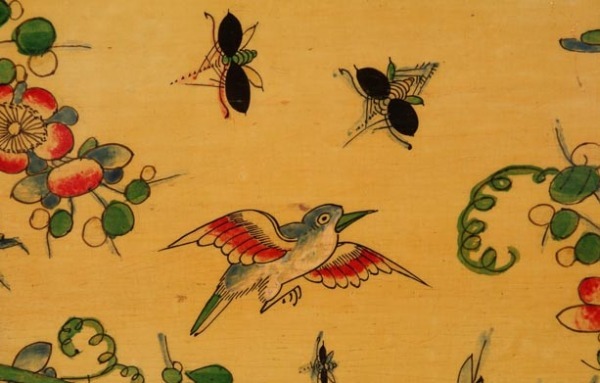 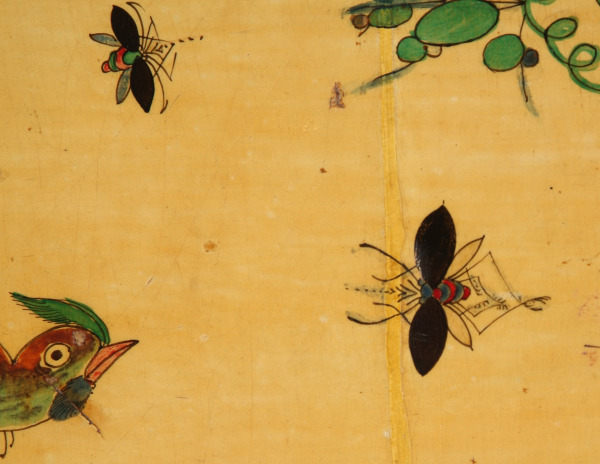 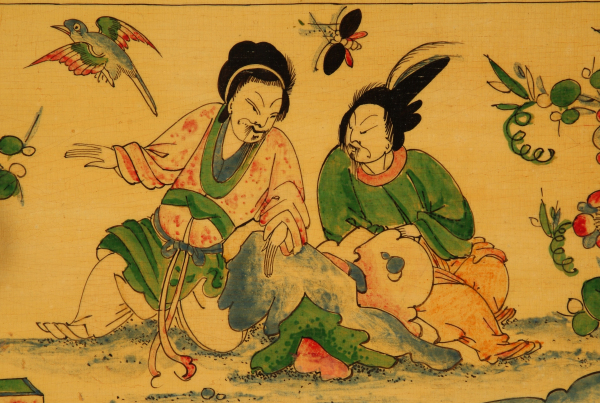 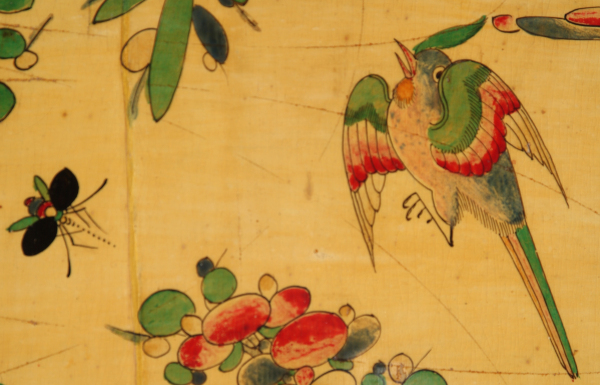 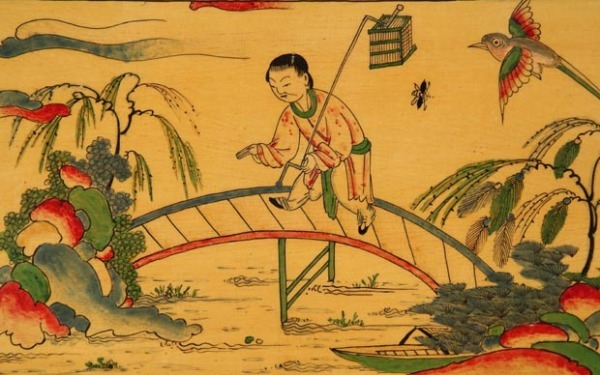 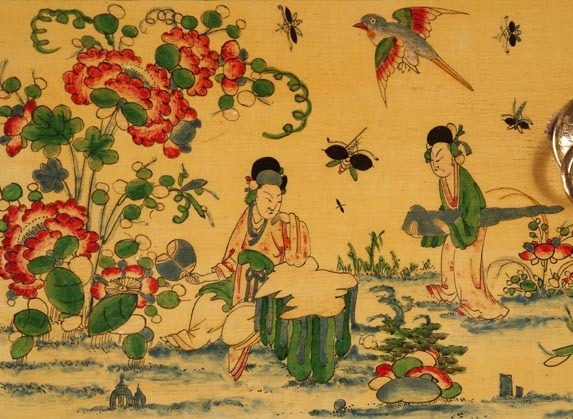 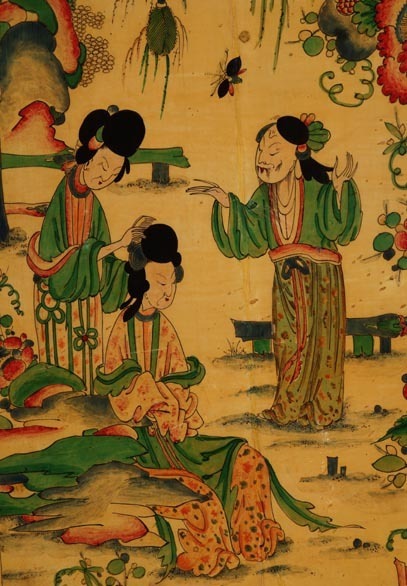 The secret of genuine Japanese lacquer was unknown but English craftsmen imitated it using varnish and shellac, known as japanning. 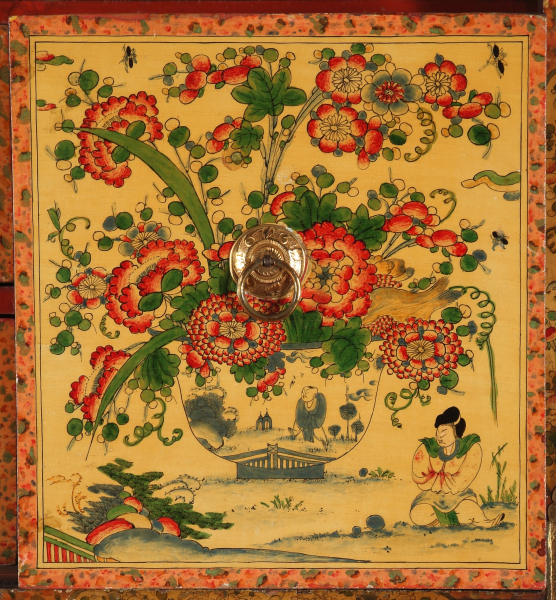 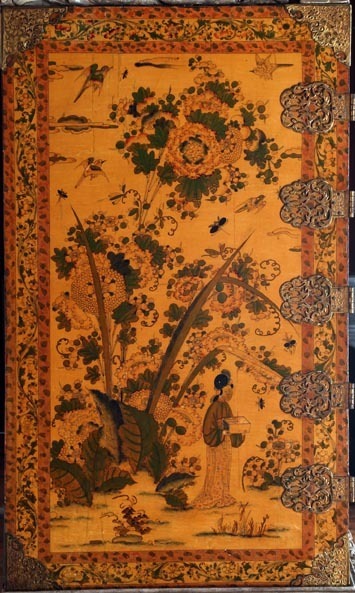 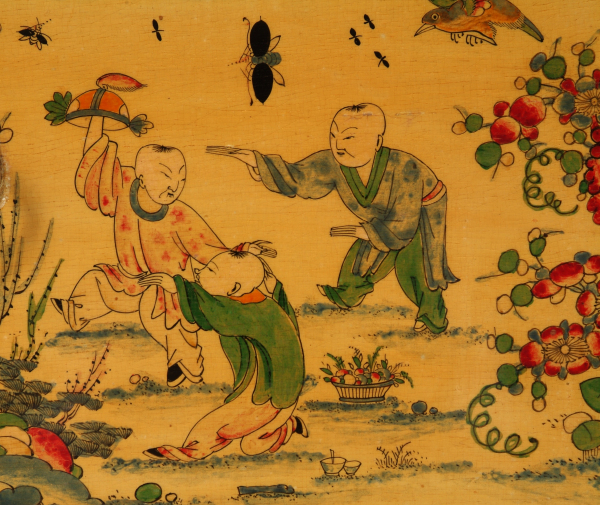 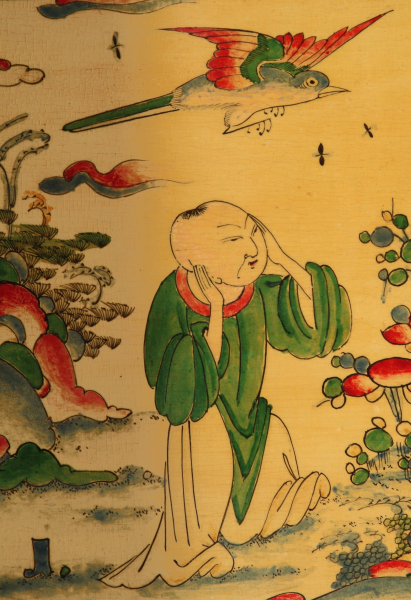 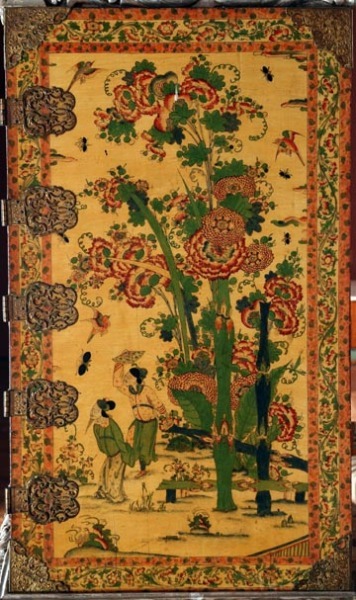 A fine imported Japanese lacquer cabinet would cost up to £50, an English japanned cabinet sold for less than half that amount. This magnificent cabinet, the finest of its type known, shows the superb quality that some English japanners were able to achieve. Instead of being made to imitate lacquer this cabinet with its rare white background was intended to resemble porcelain, such as the two Chinese famille verte plates in the case next door. 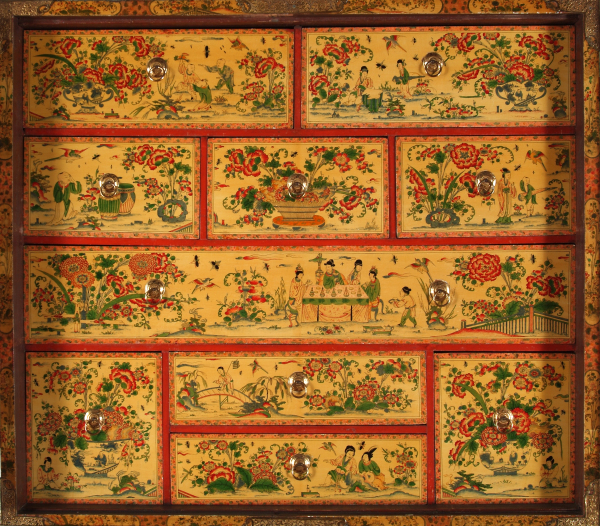 The shellac varnish has since darkened giving the cabinet a yellowish hue. 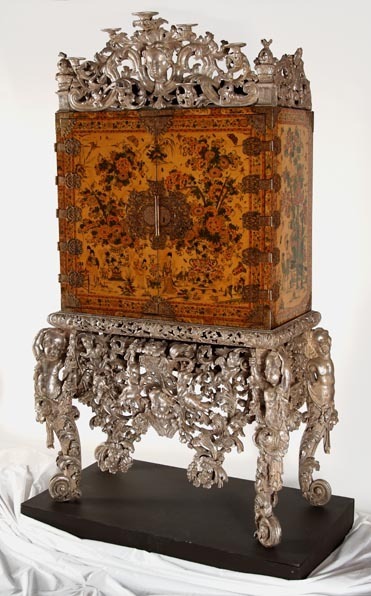 The cabinet was made for Sir Michael Hickes (1645–1710) of Witcombe Park in Gloucestershire. 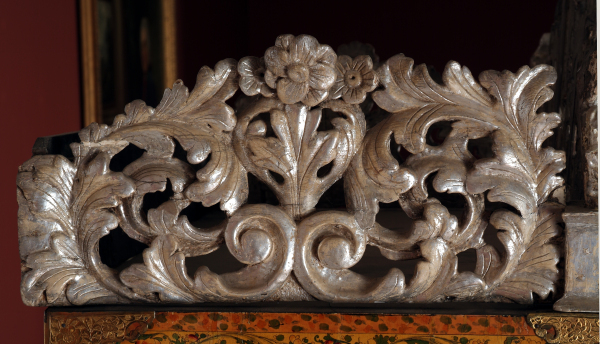 Sir Michael, originally from London, built a new house on the estate in 1697. 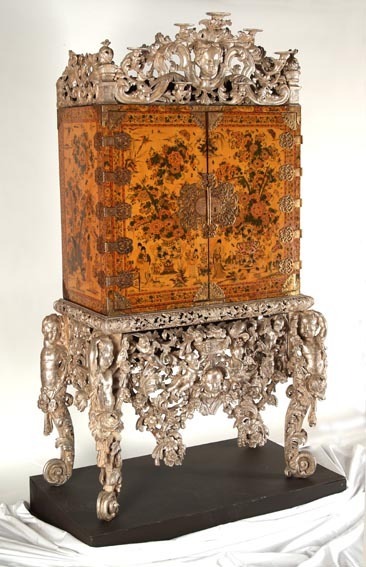 The cabinet was displayed against a fine set of tapestries inherited from Sir Michael’s grandmother. It remained at Witcombe Park for over three hundred years.